Peel or trim the vegetables, then slice into 2mm-thick shapes that allow them to be recognizable. Take your time and, where possible, cut through the roots to allow the slices to stay whole. I slice the carrots on an angle and the fennel top to bottom, and I peel the leeks into their natural leaves before slicing. Lay the vegetables in a shallow flameproof casserole or other wide pan. Place the salmon fillets skin-side up on top, with space between each one to allow the fish to cook. 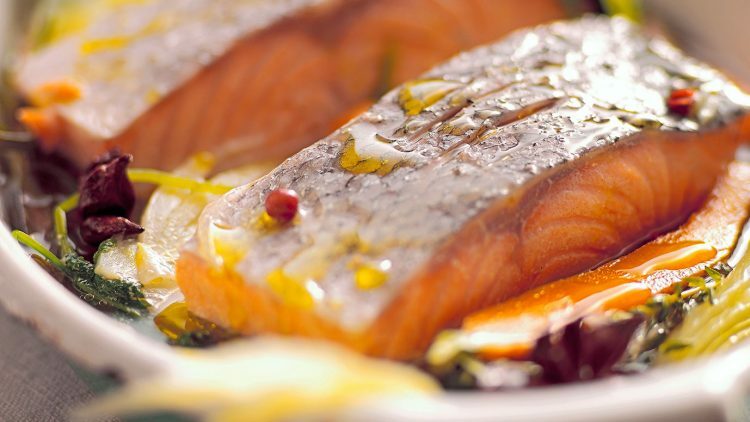 Season the salmon with plenty of sea salt and sprinkle over the wine, dill and spices. Pour in the water so that the fish is three-quarters covered, and place a ‘lid’ of parchment paper on top. Place the pan over a medium heat and bring to the boil, then remove from the stove immediately and leave to stand for 10 minutes. Lift the salmon out of the pan. Divide the vegetables equally between 4 plates, place the salmon on top and spoon over the cooking juices from the pan. Add a slice of lemon, a sprinkling of lemon zest and a splash of olive oil to each plate, and you have a well-seasoned, nutritious and simple meal ready in 20 minutes.